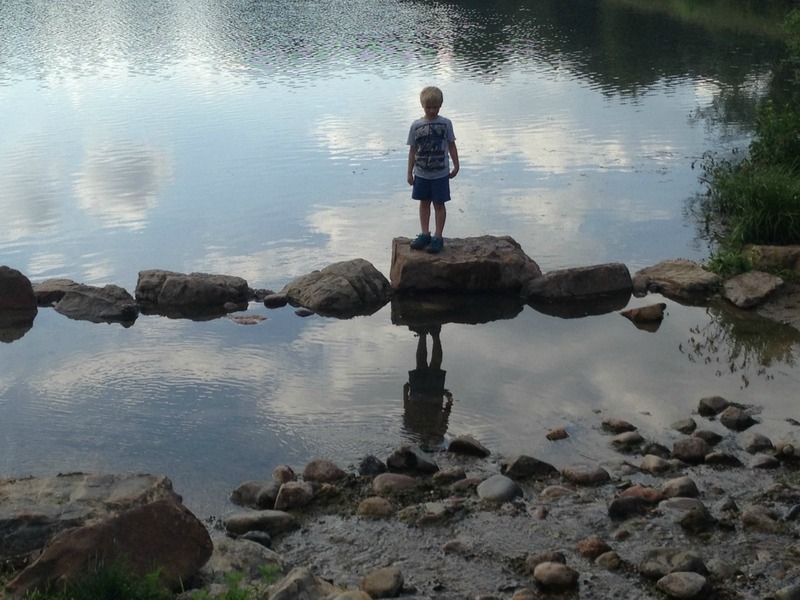 The Natural Playscape at Homer Lake is just what a directed play, orchestrated environment, playground-weary kid needs. There’s no need for an artificial safety surface, fences or plastic slides. The grass is soft, the sandpit enormous and the climbing structure is large enough for dozens of kids at a time. The suggested age range is 5-12, but even the youngest of explorers can have fun out here with a little help from a trustworthy adult helper. However, the idea behind this sort of place is to let the wild ones run free and do what they do best – create, explore, get dirty, wet and muddy, throw rocks and sticks into the water, sort out the social hierarchy without adult interference and in general just be kids. Since my children are nearly feral at times anyway, this place is a good fit for them. 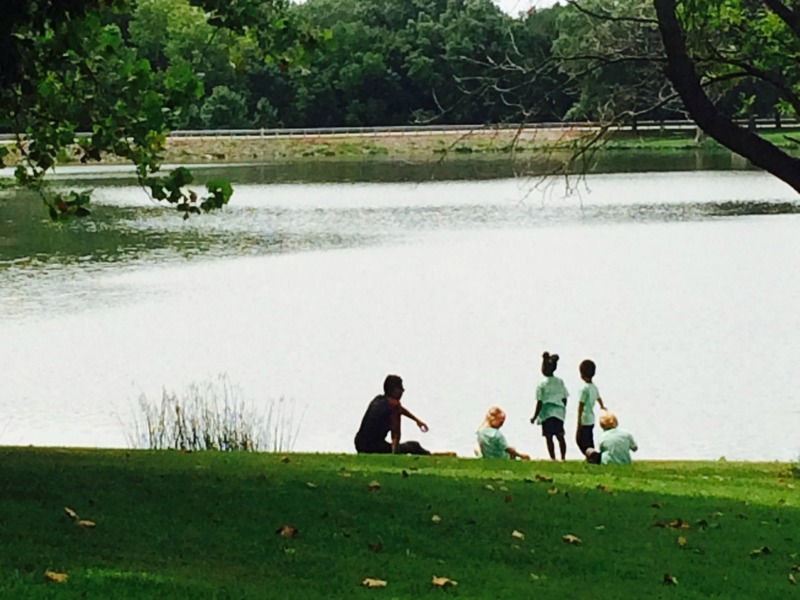 Kids love to play at the Champaign County Forest Preserve’s Homer Lake Natural Playscape. Photo Provided. My 9 and 6-year-old spent several hours with a few friends building a dam and then destroying it, then building it again in a different manner. Once they were done with that they moved on to the sandpit, the spider web and the assortment of tree limbs set up to climb on. They threw huge pieces of bark from dead branches into the water and bombed them with rocks, sinking the pirate ships before they could hit the shore and destroy the innocent. When one of them was foolish enough to toss handfuls of gravel into the air over their heads, no adult had to step in to settle things, the kids figured it out on their own. We spent six hours – yes, that’s right, six hours! – at the Playscape on a recent weekend. During that time, several dozen other children and their families moved through the environment. There was always more than enough room for everyone to play and find something to do, picnic tables and lots of shade. If you decide to check this out, keep in mind that this is a Magic Schoolbus style environment – take risks, get messy. You’re going to want a towels, water shoes of some sort, extra clothes or a swimsuit if your kid will get in the water, something to drink if you plan to be there for a while, sunscreen, etc. And a lawnchair for yourself, because there is abundant shade and while playing with your kiddo is always fun, just letting them BE is equally important and also fun! You’ll be able to see them easily in almost all of the playscape so there’s no need to worry about them wandering off or getting lost. You can make it a quick stop for an hour or play the day away. Either way, you’ll want to be prepared for some serious fun. It’s only 20 minutes from our house so I expect to find us here quite a bit this summer. 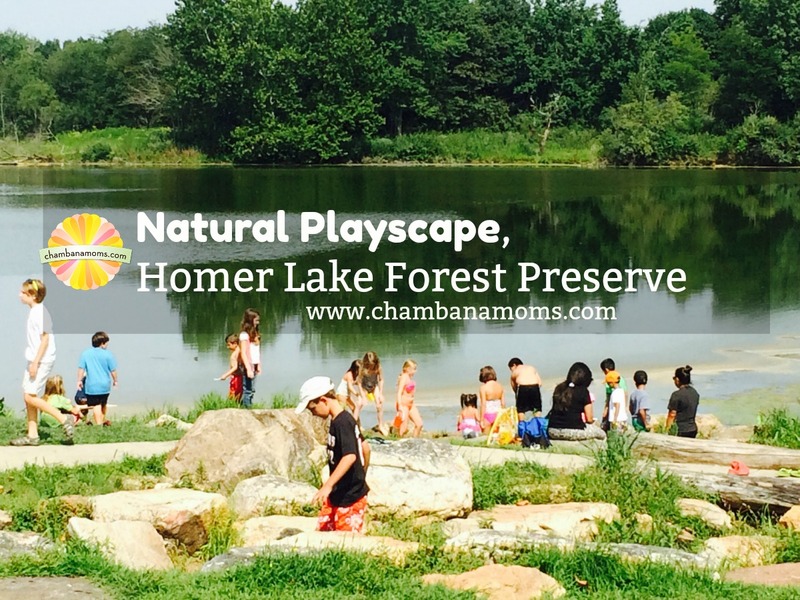 The Homer Lake Natural Playscape is located in the Champaign County Forest Preserve’s Homer Lake. The entrance of the forest preserve is 2573 S. Homer Lake Rd, Homer, IL. The Homer Lake Forest Preserve opens at 7 a.m. year-round, weather-permitting. Beginning the first Monday in April, the preserve closes at 10 p.m., and the first Monday before Halloween, the closing time moves to 5 p.m. 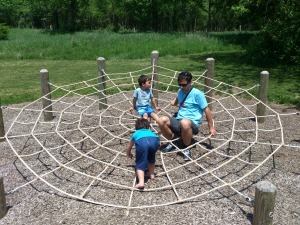 The Natural Playscape is open during park hours. You can see a map of the Forest Preserve here. The Forest Preserve has several restrooms throughout the park, including two located in the Walnut Hill shelter, which is south of the Playscape, next to a playground.